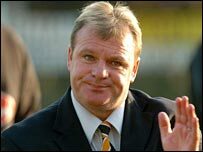 Boston boss Steve Evans has pledged his commitment to the club following their relegation from the Football League. He had been tipped to join Chester following Mark Wright's departure. Evans told Boston's website: "I have a contract at Boston and I will not be applying for the manager's job at Chester City or indeed a job anywhere." Conference chiefs will decide on Thursday whether to accept Boston, who went into administration last weekend, into their league.